Breast implants are used in a variety of settings, including for reconstruction following mastectomy, correction of congenital asymmetry, contralateral symmetrisation and cosmetic augmentation . Breast implants are available in a wide range of sizes, shapes, surfaces, materials and designs. This gives the surgeon and patient considerable flexibility to select the most suitable implants for the individual patient to enable the best cosmetic outcome. Implants can be round or shaped. Round implants are measured in terms of base diameter, projection and volume. Shaped implants are selected based on height, width, projection and volume. In profile, implants can be teardrop shaped, with the point of maximum projection near the inferior pole. Round implants have the point of maximum projection centrally. Teardrop profile implants generally create a better shape when used for breast reconstruction as they create a more natural shape. For cosmetic augmentation, either sort can be used as they are placed behind the natural breast tissue. Implants can have a variety of surfaces and textures from completely smooth to heavily textured. The most heavily textured of all are the polyurethane coated implants , which are believed to result in lower rates of capsular contracture.The photographs on this page show a macro-textured silicone implant. There is also a range of different designs available. The most common design is a fixed volume silicone implant, but there are also dual chamber implants with a silicone front component to provide shape and an expandable saline chamber behind to adjust the volume. The consistency or softness of the implant depends upon the type of silicone and the shell material used during the manufacturing process. The consistency of the silicone is called "cohesiveness" and is due to the chemical cross-linking of silicone gel polymer. 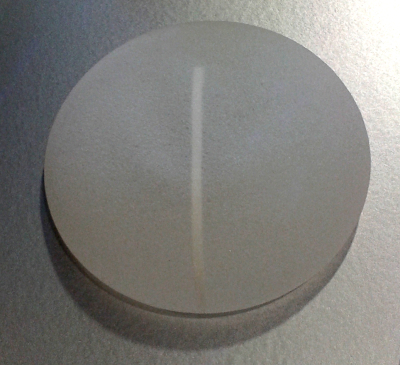 The latest development in breast implants is the use of two different gels within the same implant (such as the Diagon\GelTM implants from Polytech). Tissue expanders are also used, which contain only saline and have either an integral or remote port which can be used to inject saline for expansion. Modern implants have been designed to reduce complications such as silicone leaking through the shell material (called "gel bleed"); fold formation and rupture. Some women are concerned that having a mammogram might damage their implants but this is unlikely - for example, Allergan test their implants by compressing them with over ten times the force of a mammogram and ensuring they don't rupture. Allergan also quote a 1.7% rupture rate for their NatrelleTM implants at 8 years (median) after placement1. Complications of the use of breast implants include: seroma and periprosthetic space infection; wound infection; haematoma & bleeding; loss of implant(s); stretch deformities and implant malposition, dislocation & rotation; capsular contracture, shell disruption or leaks; chronic pain; undefined symptoms associated with connective tissue disorders; risk of anaesthetic and deep vein thrombosis and pulmonary embolus. In 2014, the MHRA in the UK published a safety alert relating to breast implants. They report that of an estimated 5-10 million women worldwide who have had breast implants, whether for reconstruction or augmentation, 130 have developed anaplastic large cell lymphoma (ALCL), a rare type of non-Hodgkin’s lymphoma (NHL), a cancer involving the cells of the immune system. 23 cases of ALCL have been reported to date (2017) in the UK. To put this in context, Cancer Research UK report that the lifetime risk in 2012 in the UK of developing breast cancer is 1 in 8 for women. For more information, read the ABS statement about ALCL; the latest statement from the MHRA; and the ICOBRA (International Collaboration of Breast Registry Activities) statement.